Casual observations of a second-hand nature, primarily through the lenses of hunters in more temperate zones, where the probability of flight at nearby wetlands is confined for the most part to sunlit months, suggest that damselflies in harsher climes, notably those of coenagrionoid lineage, often perch with their limbs tucked in, as if they were seeking to hug the twig or trunk that bore them, and torso held close to the substrate. Such postures, which are also adopted by Palearctic libellulids, may arise from attempts to conserve heat during cold spells and dew-laden mornings. 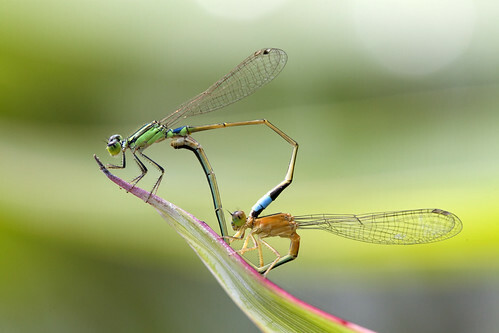 The damselflies also frequently hold their wings, not clamped together like a stiff banner, but in a semi-open, tent-like position over their abdomens. This pose is seldom seen in local pond damsels, which also tend to land with their gear unflexed and bodies at right angles to their reed of choice. Thus, the sight of common bluetails clinging to stems with unusual coyness and wings draped over their hind segments offered a point of minor interest during two testy hours at a tiny town park built on the body of a buried swamp. 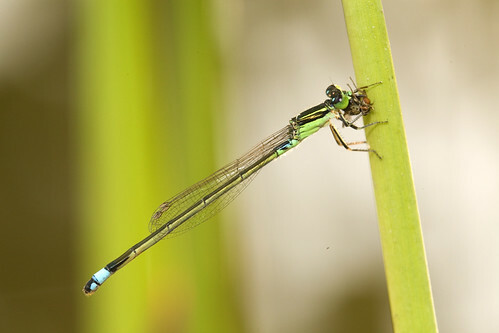 Ischnura senegalensis shares the park's pond with an irrepressible population of blue sprites, which dominate the more exposed reaches of the water body, where they pursue each other, interrupt midair unions and joust for choice lilypads. 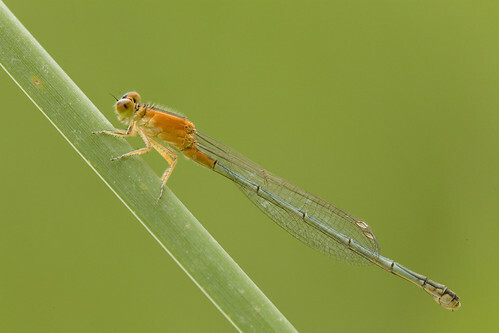 The bluetails remain for the most part in a reedbed flanked by a closely cropped lawn, where they sally for shoreflies and midges at knee-height, safely below the preferred zone of most sympatric dragonflies save rogueish trumpet tails. 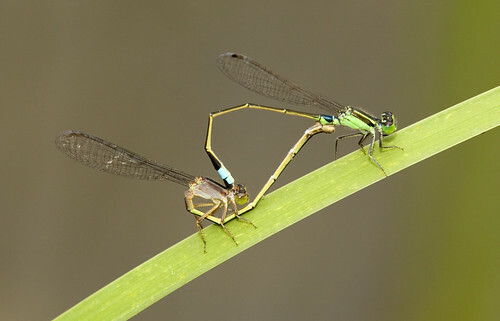 Come midday, love trumps lunch in what passes for odonate minds, and the marsh teems with bluetails in copula. Males in standard issue green, black and blue can be found gripping the necks of mates in all three morphs known to the species: olive brown getups, mild orange frocks, and andromorphs that have failed to trick their suitors with a guise outfit. A brief, intense downpour sent the park's users to a gazebo between the pond and the PIE, although two young men, armed with flexible rods and flashy lures, braved the rain to cast their lines at promising nooks. One bagged a small Channa, which flew off the hook and flopped on the grass before its captor grabbed it by the gills with accustomed ease and flung it back. Packs of baby snakeheads, clad in black and orange stripes and with oversized heads that already betray their appetites, roam the shallow ends, rising for air at unruly intervals and probing the weeds for minute prey. The true monsters of this moat, however, are Amazonian cats that lurk in the deeper corners of the pond, whose gapes threaten the sanity of visitors who sit too close and which demand tackle far stronger than those of schoolbreak anglers. When the storm faded, the fishermen continued to work their ground, as did the bluetails in their bed of broken streams. But lone females, left on the sheath or perhaps recovering from the trauma of a penile scoop, clutched reed blades with atypical langour, wings ajar and adrape over their rear quarters, mirrors of their cousins in chillier parts. It could well be that damp and a palpable drop in ambient temperatures prompt such behaviour, which may serve to reduce thermal loss and dry vital appendages. But there was no time to lose over this mystery, for the break was just a breather before the skies unleashed anew a wave of wrath on this island on the crossroads of ancient winds and of late at the mercy of weather that has gone off the rocks and into waters that rise to bar the way, sink our pride and resist all bids to turn back the clock and rein it in.